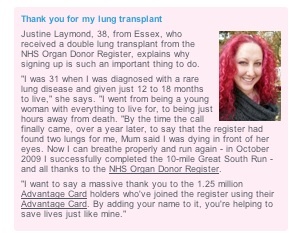 You might have noticed that England and Wales are taking different approaches to increasing organ donation rates. 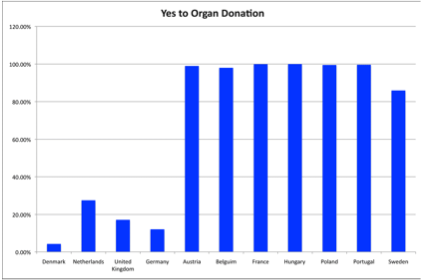 They’re both addressing the problem that the UK’s ‘opt-in’ system gives a much lower rate of donation than ‘opt-out’ systems in some other countries. You can guess which nations in the chart below use which approach! The difference in outcomes is stark. In terms of behavioural effects, this is all about defaults. And the plan in Wales is to use this insight to change the default to presumed consent. In England, a different approach – just as legitimate – has been chosen: relying on Exposure Effect, rather than Default Effect. So, when you apply for a driving license, you will have to choose between being on the donor register, or not. 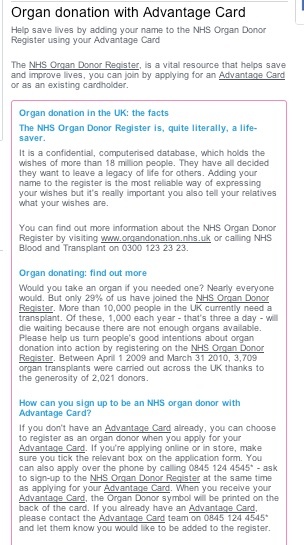 There won’t be a ‘don’t know’ option, which strengthens the effect, and we are sure to see donor rates increase. So I was pleased to be reminded (by@alex_north) that Boots is helping the drive to improve rates, by asking people if they want to be added to the register when they apply for a store loyalty card. I’ve clipped their web page on this (right). Again, this is about employing Exposure Effect. My reason for posting this is simply to flag up how straightforward it can be to use behavioural effects. It doesn’t require masses of academic input; it just requires a bit of literacy about behavioural effects. Speaking of which, good to see Boots adding the clip below, using Emotional Engagement to encourage people to ‘do the right thing’.